You, Me and Movies: Chifilmfest Review: "The Reconciliation" is a brutal film of survival. Chifilmfest Review: "The Reconciliation" is a brutal film of survival. In 1945, Poland was emptying Nazi concentration camps as the war was beginning to end. With all that free space and set up for camps, the Polish government decided to turn those Nazi concentration camps into Communist Labor Service Camps. The Polish Communist Security Service began rounding up those Poland deemed as “national traitors.” They would find Germans, Poles who were sympathetic to the Nazi’s and anybody else who worked close with the Axis powers and brought them to these camps. While the prisoners of these camps weren’t being starved, the treatment of these people was horrific. While these people were traitors, do we really live in a world of an eye for an eye? If someone has done something terrible to you, does that give you justification to act just as vile towards them? It’s a similar dilemma that came up in the final “Hunger Games” movie, and it got me thinking. Do the actions of the Districts right after all the years of mistreatment by the Capitol? “Zgoda” AKA “The Reconciliation” is a movie that asks that question, and it never leaves any real answers. Because honestly, what is the right answer to that question? How can you even begin to answer it? Yes, what the Nazi’s did to millions and millions of people allow those were oppressed the opportunity to stick to the Nazi’s once the tables are turned? Our we good guys for treating the bad guys the exact same way as they did? There are moments in “The Reconciliation” that are just plain grim. That are just plain horrific. “The Reconciliation” is a harrowing film, an incredibly powerful film and at times a positively bleak film. The film also adds an extra layer. 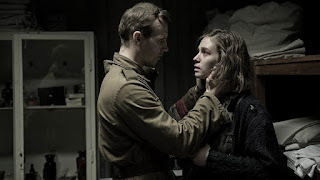 The film focuses on Franek (Julian Swiezewski), he is a man who proves his talent to the security guards at one of these Polish labor camps, and they allow him to become a guard at the camp. Little do they know that Franek’s true intentions are to rescue Anna (Zofia Wichlacz) who is in love with. What Franek doesn’t know is that Erwin (Jakub Gierszal) is at the camp as a prisoner. Erwin and Franek were once very close, and both liked and cared for Anna. There is a complication for Franek when trying to free Anna, and Anna is torn for who to care for. In most movies, a plot with a background such as a labor camp may feel sappy and wrong. But the crew behind this movie do a good job making this story feel urgent. They make everything in this movie count. From its stunningly shadowy cinematography, it’s fasted-place plot, to its haunting musical score to its impossible-to-shake ending. The acting chops by Julian Swiezewski, Zofia Wichlacz and Jakub Wichlacz all phenomenal work here, which only adds to the fond power of this film. Each actor jumping right in and giving it their all. They make this movie count, the work overtime for the plot, which would be ridiculous in any other movie feels grounded and natural here. I don’t know if any of you have ever been a part or inadvertently be a part a love triangle. I don’t think I ever have personally. I know I have liked girls in the past, but I don’t think I’ve ever competed for the affections of another girl. I know boys have liked girls I have been with in the past, but it never felt like I was hoping my significant other would slip away from me. But I do feel that these three actors do a magnificent job of portraying what a real love triangle looks like. There is frustration, there is guilt, there are hurt feelings, there is suspicion, there is jealously and it all works profoundly well here because these three actors make us believe it. We can feel that these three tortured souls are attracted to each other, but whatever life they had before this mess is over, and something new has emerged in its place. The movie’s main focus isn’t really on the love triangle though. The main focus is put on survival. It’s a common theme for movies like this, but I think “The Reconciliation” does good at communicating the purpose and circumstance of survival. It shows us why the human spirit is so resilient. What drives us to keep living this one, fragile life that we get. The ending, that like I said, is impossible, is almost a fable. A punishment of sorts on one character in particular, and how that punishment can harm and affect those around him. Hate and despair can latch on to anyone and anybody trapped in that particular person’s orbit. The shocking ending only highlights that revelation. I don’t know if there really was a Franek in Poland on the eve of World War II’s end. I don’t know if there was a girl he liked named Anna and I don’t know if Erwin really existed. What I do know is that “The Reconciliation” tells truths about the human spirit and the human experience, and the themes it relates are universal to all.